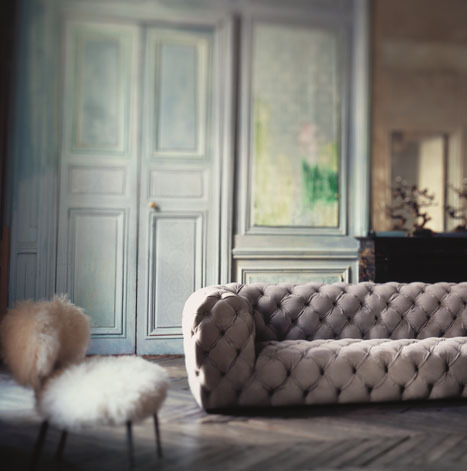 Tactile is a classic sofa with a twist of modernity in its design. It is made from soft leather upholstery and its Polished Stone color helps enhance its look of elegance. It looks sleek but cozy at the same time due to the use of soft leather. 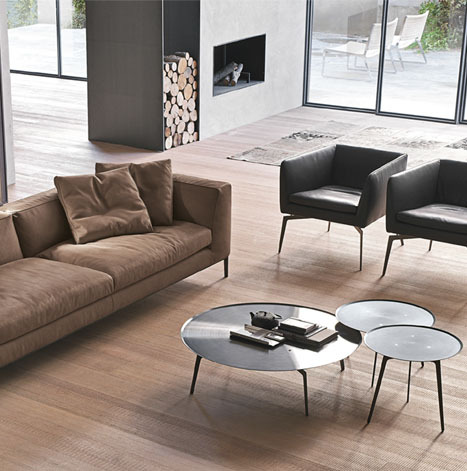 This type of sofa is perfectly suitable for formal and corporate settings. Handcrafted bull leather upholstery. Eclectic design with a modern twist. Famous for its Italian iconic designs. Furniture valued as an art. Sacco is the type of chair that is fashionably laid-back. 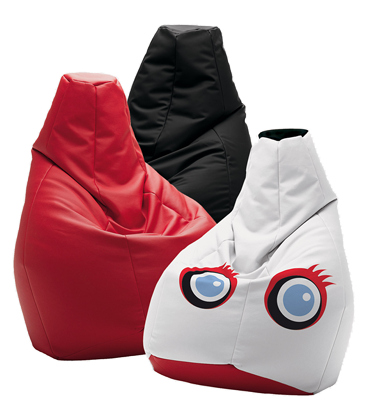 Most importantly, it's the first ever beanbag in the world. It's the perfect chair for lounging around as its style was created to perfectly adapt the form of the human body. The design was made by Piero Gatti, Cesare Paolini and Franco Teodoro in 1968. Its inside consists of highly resistant expanded polystyrene pellets. The cover can be in different kinds of designs such as: Volo, Tela Egitto, Pied de poule, Sole, Techno (for outdoors) and leather. Due to its originality and uniqueness that caused a global trend in its design, it has won awards such as Compasso d'Oro Selection 1970 - prize BIO 5 Ljublkana. It is also showcased in museums such as the Museum of Modern Art, New York and the Israel Museum, Jerusalem to name a few. 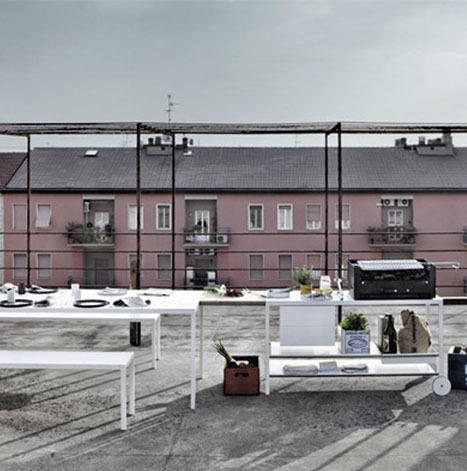 Ami is designed by F. Rota for outdoor seating. The lively colors used in its designs give off a modern and pleasurable atmosphere in any place. Its structure is made of stainless steel with a satin finished base and plastic spacers. The Luz fabric upholstery is hand woven with light fabric and the seat cushion is 100% polyester and water repellent. Moreover, it has a high resistance to abrasion, UV rays, sea and swimming pool water. There are a variety of color combinations to choose from that offers clients a chance to customize their own design. 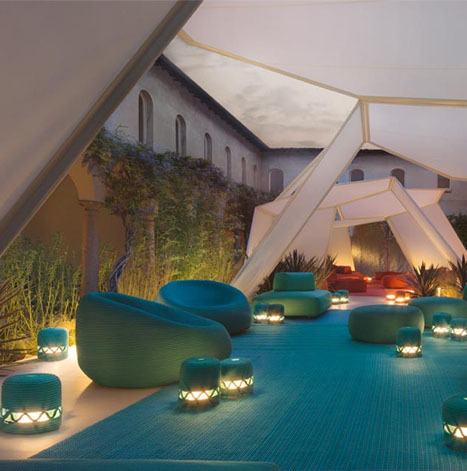 Outdoor furniture and rugs in special materials. Uses high quality, contemporary technologically-advanced textiles. Minimal metal furniture with high quality finishes. The Element rectangular table is part of the Element collection (which includes chairs, dining tables, low tables and console tables) that was designed by the reknowned Japanese designer named Tojukin Yoshioka. This collection was inspired by Tojukin's experiments and research with crystal structures which were then expressed into abstract representations of these natural structures. Most models in the collection have a single stave but the bigger ones have two for extra support. The signature feature for this collection is the slanted metal elongated stand in between the base and the top. This rectangular Element table top therefore looks like it is balancing due to its angled stand. Queen is a chair that mixes traditional and contemporary style in its design. The glossy lacquered finish of the chair gives it elegance and the optional fabric covering cushion made of velvet complements the finality of its design by adding extra comfort to it. 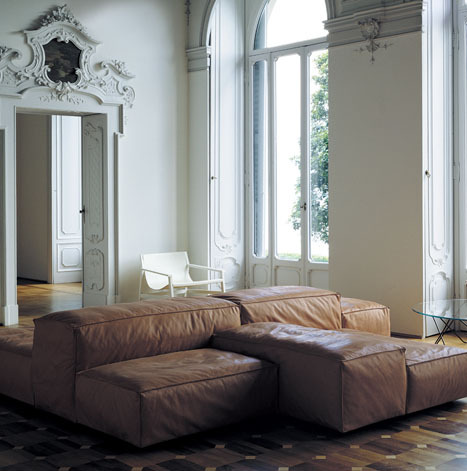 The chair was designed by Claudio Dondoli and Marco Pocci. 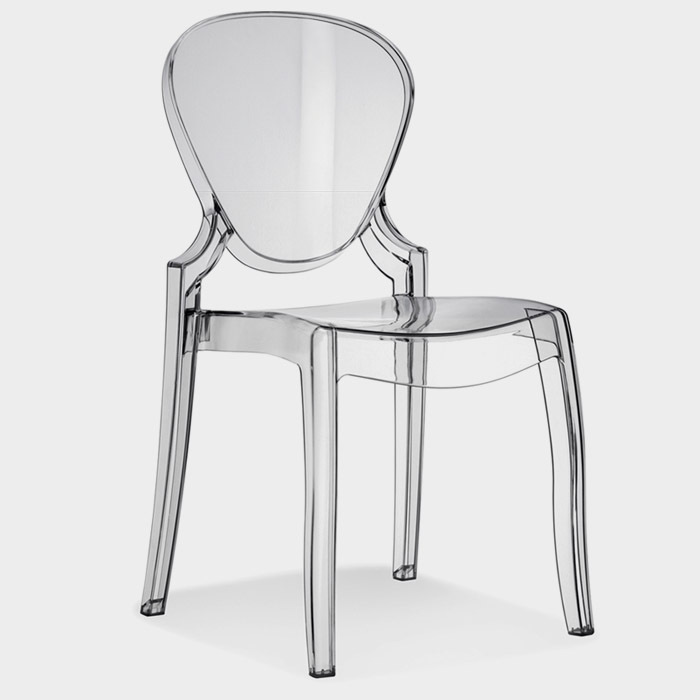 Its material is made from polycarbonate which is very durable. Moreover, it has seven available colors to choose from such as the white or black full color version and the clear, violet, amber or smoke grey transparent version. Signature upholstery items with high quality materials and crafted finishes. Off Cut is a bookcase/ room divider created by Nathan Young. The structure consists of small vertical and horizontal pieces of wood in different sizes that gives it a light and ethereal construction. Its minimalist design exudes a kind of simplicity with a hint of creativity. The material used in this piece is solid American Oak or Walnut splints. 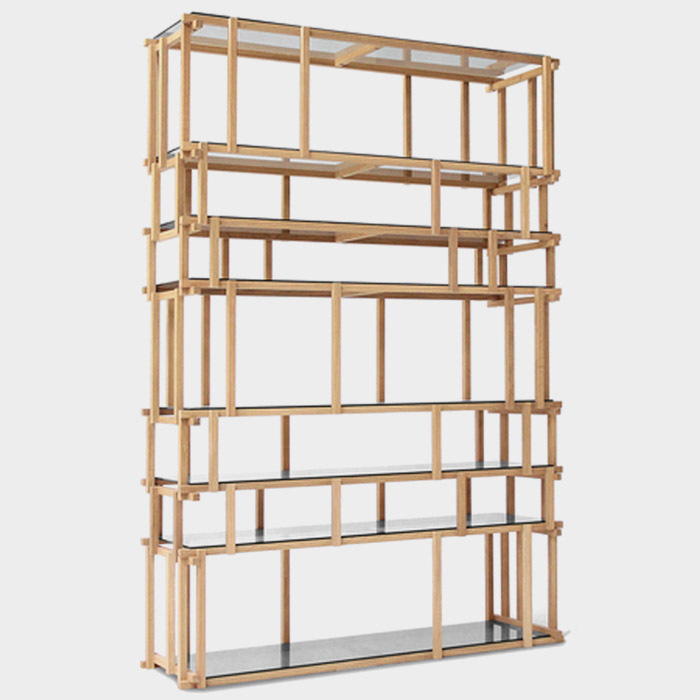 The six shelves used to support the materials to be placed is 6mm thick in clear crystal or in wood. The base shelf is made of wood and has stabilizers. 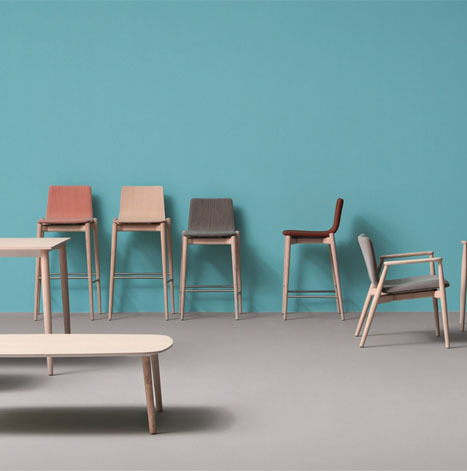 Contract furniture designed in various materials. 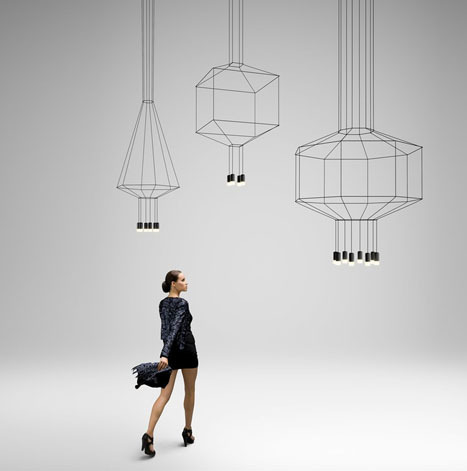 Wireflow is a collection of hanging lamps that resembles a simplified futuristic look of a chandelier. 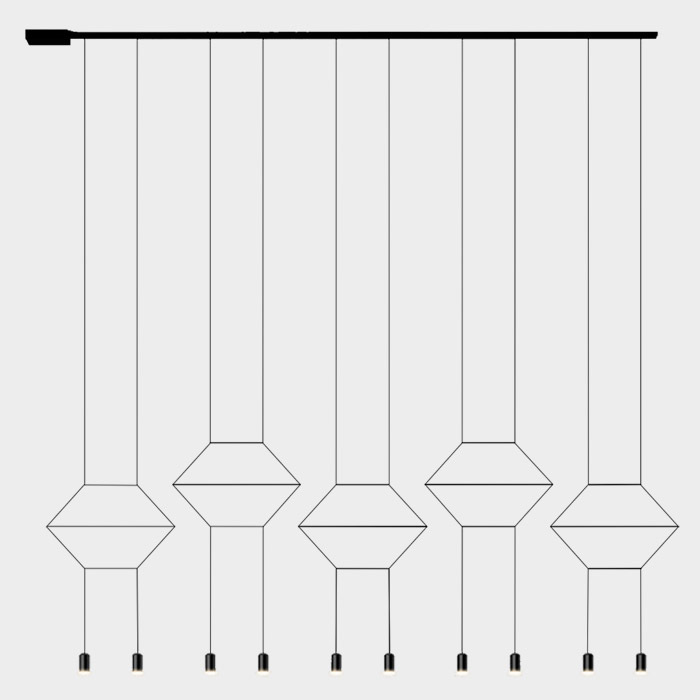 This wonderful masterwork by Arik Levy appears like fine cables that are well-structured with LED terminals at each end. The minimalist design of this lighting is ideal for high ceilings and can make any place have a chic and modern vibe. It also uses the CREA product configurator software therefore the design can be altered to suit any requirements. Creating award-winning lights that aren't lights in a conventional sense. 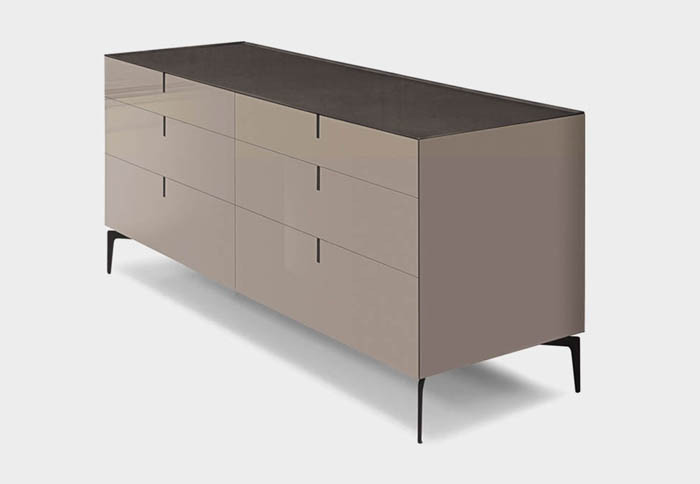 Meridien is a chest of drawers with a modern metropolitan flair designed by Giuseppe Bavuso. The simplicity and modernity of its linear design makes it look sophisticated and classy. The small handles blend well with the overall design of the drawer therefore making it look flawless and well-refined. The top and base is in painted or stainless steel and the design can be in mat lacquered MDF or in heat-treated oak. 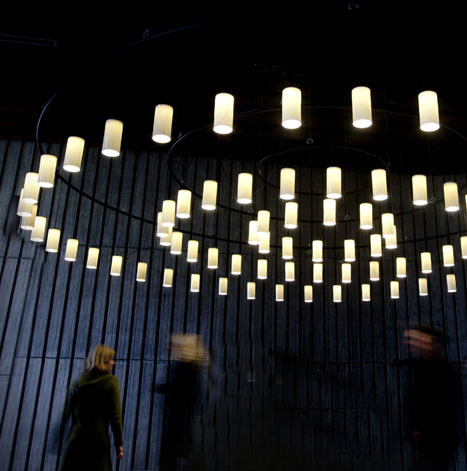 Decorative designer lighting by prominent designers. TMC15 is the latest edition of the height-adjustable floor lamp created by Miguel Mila. The design has a combination of modern and industrial elements. It is similar with its well-praised original version but slight improvements were made to its height adjustable system. Its metal structure's upper half is chrome-plated while the lower part is colored red. The lamp used is white methacrylate. To switch it on/off, the cable should be pulled lightly. Modern, refined style of furnishing and design. 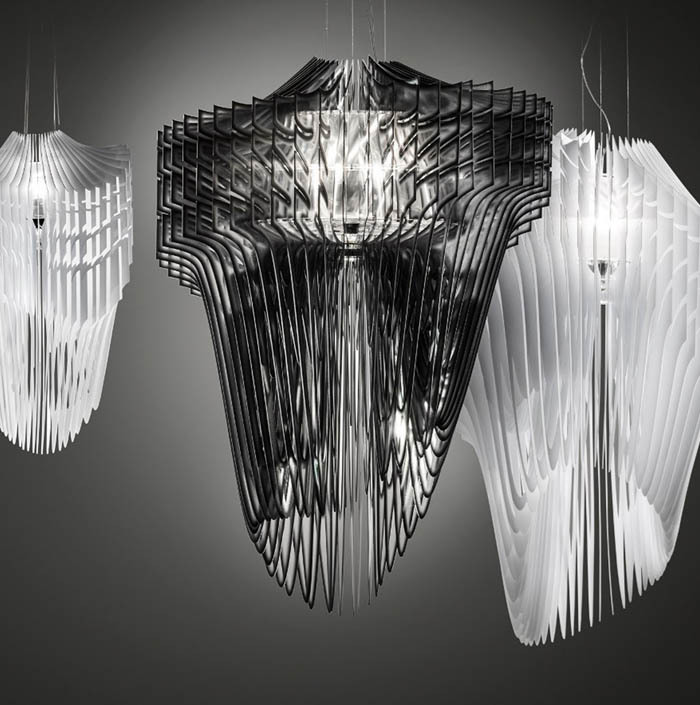 Aria is an elegantly structured pendant lamp designed by the world renowned architect, Zaha Hadid. It is composed of 50 layers of translucent Cristalflex®, a lightweight polycarbonate material, with a black finish to complete its sophisticated and complex look. The lamp inside contains six light sources facing outwards with one downward facing spotlight which gives the entire room enough lighting for a luxurious ambiance. This piece of brilliance is lightweight but has that glassy look that exudes elegance. 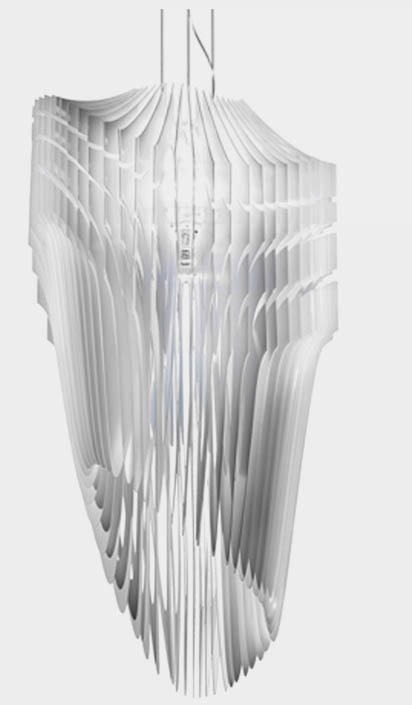 A combination of Hadid's architectural skills and modern technology can be seen in this piece of contemporary lighting. This type of suspension light is ideal for residential or commercial settings. Timeless and original designs for lighting fixtures.